There are five regular markets in Phimai town: the night market, two morning markets, the Monday market and the Eight market. 1. The night market (talat night) is located in Anantachinda Street, in the town centre adjacent to the Town clock. The night market opens daily at about 6pm or just before. Things for sale there include clothes, fruit and vegetables, meat and fish, CDs and DVDs. 3. The Monday market (talat jan) takes place on Monday evenings on the streets near the main bus station (from about 4pm to 8pm). Items for sale include clothes, food and household goods. 4. 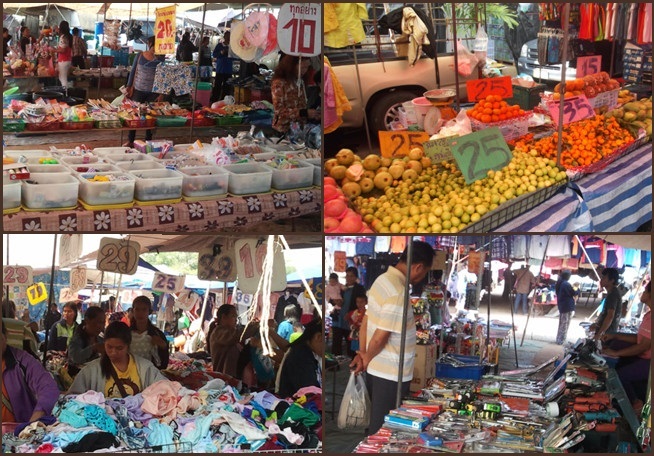 The Eight market (talat pairt) is located on land near Pratu Chai and Phimai Vocational college. It takes place on dates with an eight in them, so there’s an “Eight market” on the 8th, 18th and 28th of each month. The Eight market is open from 6/7am to about 2pm. You’ll find a lot of clothing and fruit for sale there but you will also find household goods (including kitchenware and tools), linen, plants, puppies and pet fish. The Thai word for market is talat (ตลาด). 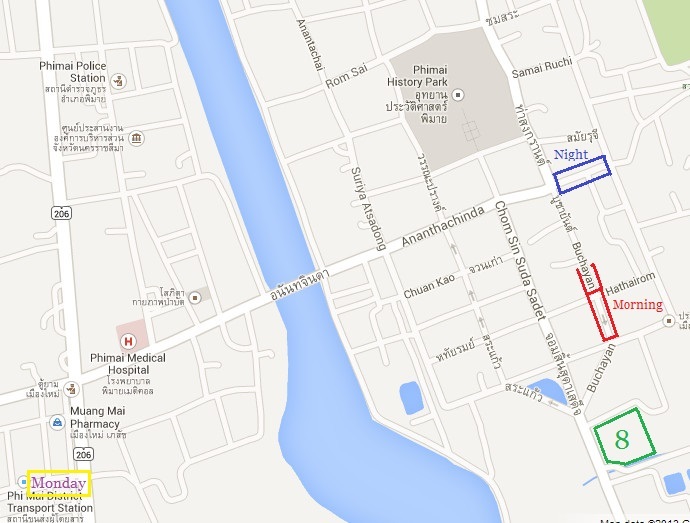 Above is a map showing the locations of the four regular markets in Phimai town.